Ownership / Access: Now home to the National Museum of Venosa. Notes: The Aragonese castle, built in 1470 by Pirro del Balzo Orsini. It has a square plan with four cylindrical towers. The shining sun, the del Balzo coat of arms, is visible on the western towers. 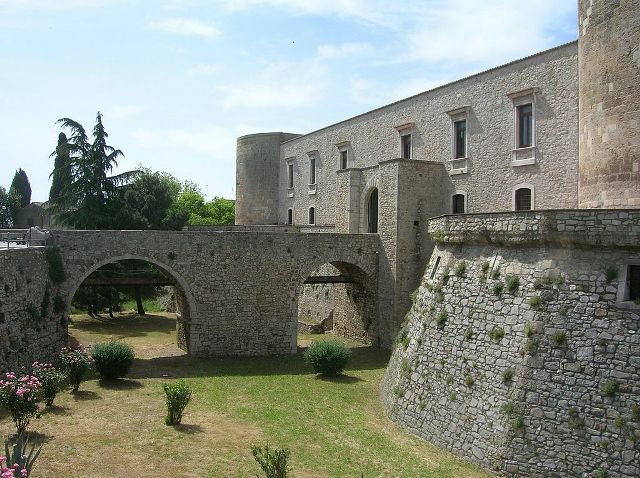 It was turned into a residence by Carlo and Emanuele Gesualdo, who added also an internal loggia, the north-western wing and bastions used as prisons. From 1612 it was the seat of the Accademia dei Rinascenti. It is now home to the National Museum of Venosa, inaugurated in 1991, with ancient Roman and other findings up to the 9th century. The entrance is preceded by a fountain conceded by King Charles I of Anjou.